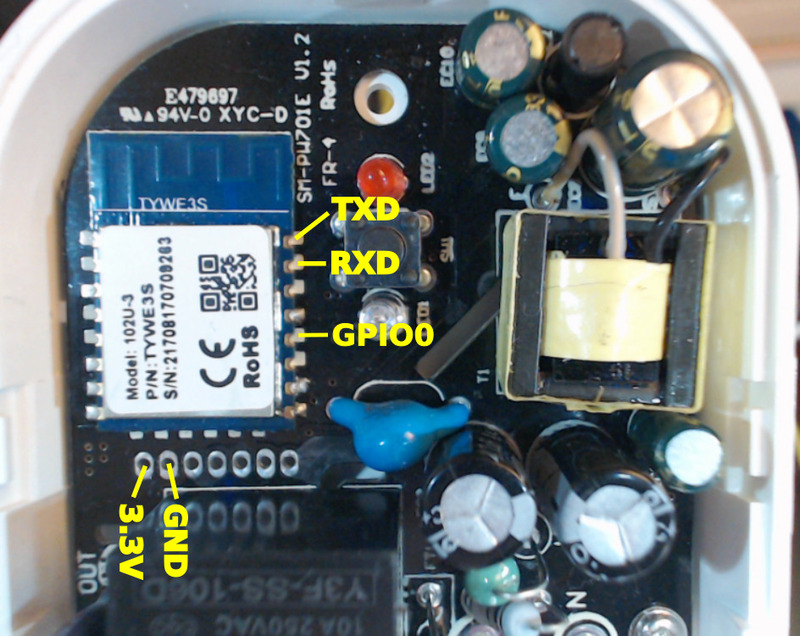 Among the many WiFi controllable smart power switches, various vendors sell models named SM-PW701E. Like the Sonoff S20 devices, they contain an ESP8266 (or alike) module and can thus be reprogrammed with your own firmware. Unfortunately, the model described here doesn’t make this easy: the necessary pins to program the ESP8266 aren’t connected to anything. The pinout of the TYWE3S module is identical to an ESP-12F module (without its bottom row signals). Neither the UART signals, nor GPIO0 are routed to the unpopulated header. In fact, they aren’t even soldered onto the pads of the PCB. It seems, as if the header is only there for testing: in addition to the voltage pins it only contains the three GPIO pins 4, 12 and 13. The remaining two pins are definitely not connected to the ESP module. I didn’t check whether they are connected to something else on the board. Don’t forget to add a corresponding enum value to supported_modules and kNiceList.